After numerous attempts, Andrés is still determined to cross over to the United States at the Tijuana border in search of a better life. While in Tijuana, he ends up befriending two women, Cata and Ela, who run a convenience store, and each time he is sent back to Mexico, he returns to the comfort of their friendship. Rigoberto Perezcano was born in Zaachila, Oaxaca, Mexico. He has directed documentaries, with which he learned the art of filmmaking. He has always been in awe with the dramatic and fictional possibilities that lie within the genre. His film XV in Zaachila participated in different festivals, receiving various national and international awards. In 2001, he worked as an intern for Rockefeller-MacArthur Ford to write the script of the proyct titled “Carmín Tropical”. He is currently an intern of the “Sistema Nacional de Creadores de Arte”(National System of Art Creators). 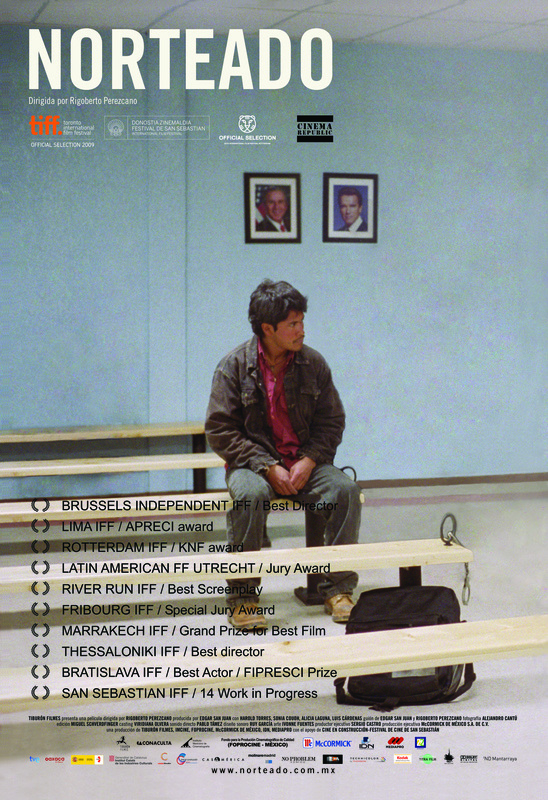 Norteado is his first fictional movie, and it has participated in the 14th edition of “Construction Film” in the San Sebastian Cinema Festival. The movie won three awards: “Industry Award”, “Spanish Television Award”, and “Casa América Award”.